Vornamen + Wunschfarbe Sternanhänger + Angabe ob Erwachsen oder Kind? 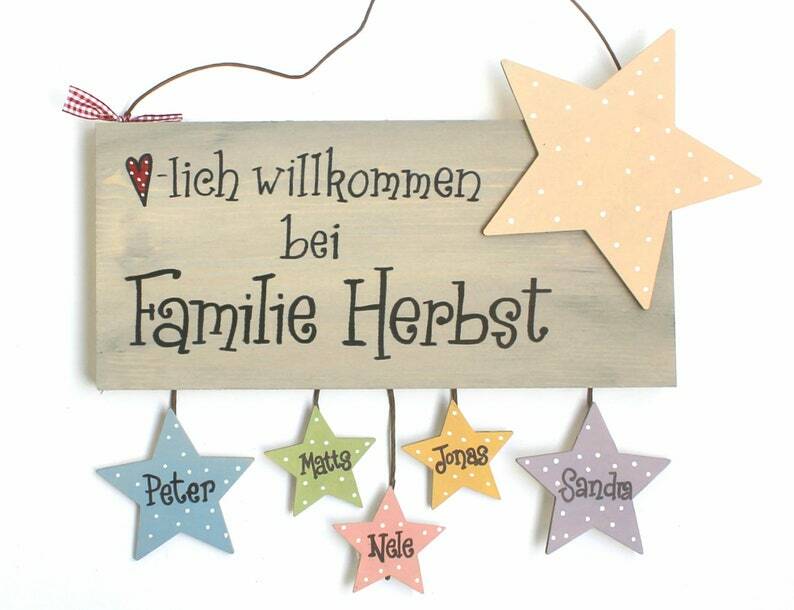 -The main sign in shabby smoke blue-grey primed with desire text and font, the star pendants for members of the family to grow..
-The two stars for the parents frame a little bigger the children-the Sternderl in the middle can easily be extended/extended for future generations. For longer/shorter names we allow to adjust the label. If the family planning is not yet complete, we can also design stars as "placeholders", for example with a & sign. Individual stars can also be reordered later on, to be found in our shop department "accessories". Lieferung schneller als erwartet. Das Ergebnis ist ganz großartig geworden! Sehr schnelle und herzliche Kommunikation. Alle meine Wünsche wurden toll umgesetzt.